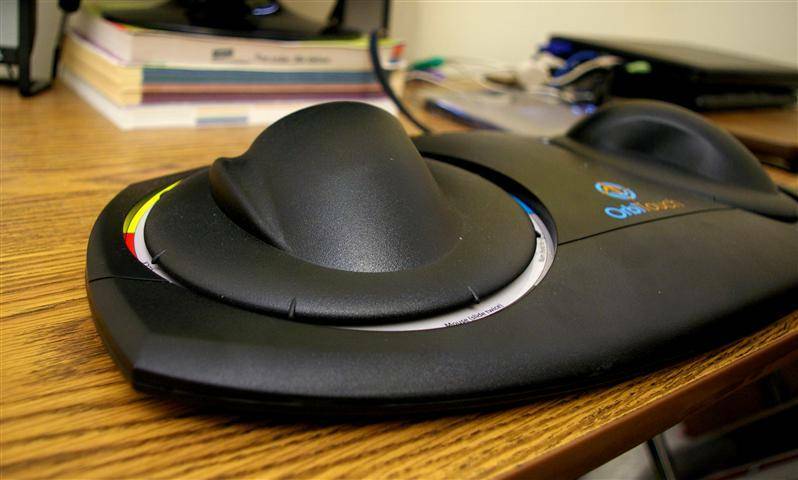 The orbiTouch from Blue Orb (formerly Keybowl) is one of the strangest-looking creations ever to be called an input device. Compared to a keyboard and mouse, it’s inefficient and relatively slow. But for the handicapped or those with severe RSI, it’s a lifesaver, enabling many of these folks to communicate when they otherwise could not. 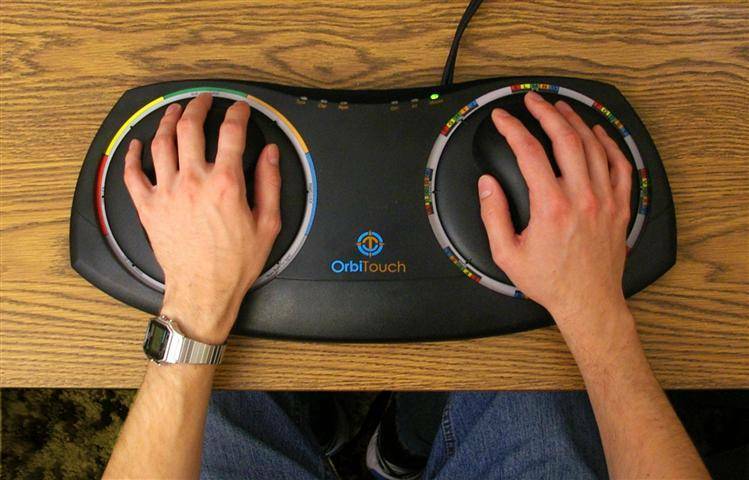 The orbiTouch accomplishes this by totally changing the way the user interacts with the computer. Visually, there’s not much of anything to which you could compare the orbiTouch. It doesn’t look like like a keyboard. It doesn’t look like a mouse. It doesn’t even look like something you might use to play a video game. The one visual clue it does give turns out to be misleading. Those domes, those giant mouse tops on disks, look like they should rotate, but they don’t. Instead, they slide – up, down, side-to-side, and diagonally. The eight possible positions on the left dome correspond to six color codes – red, yellow, green , orange, blue, and black – plus two specific actions (more on those in a bit). The orbiTouch is operated by sliding two domes to make different combinations. Each of the eight positions on the right dome can do one of six different things, depending on which color code is selected on the left. For instance, to type the letter E, you would slide the left dome to three o’clock – the Blue position, and then slide the right dome to nine o’clock, which is the key group containing E with the blue color code. To make a space, you slide the left dome to Black at six o’clock and the right to three o’clock, where you’ll find Space on the black color code. While this sounds a little complicated when described, it’s really very intuitive. It’s a little difficult to envision how the orbiTouch could serve the function of a mouse, when the domes don’t rotate and have a very limited range of motion. Instead of trying to replicate the motion of a mouse or trackball, the orbiTouch works more like the little finger-joystick on a Thinkpad. When it’s in mouse mode, a nudge to the right dome sends the pointer traveling in whatever direction you push it. It will continue to travel that way until you release the dome, or until it hits the edge of the screen. The left dome is used for left-click and right-click. Mouse mode, like a few other special functions, is activated by double-sliding the left dome – in this case, to six o’clock. A double-slide on seven-thirty gives you Caps Lock, and you can hold down four-thirty for Num Lock. The motion of using an orbiTouch puts me oddly in mind of a weaver shuttling an old-fashioned hand loom – big back-and-forth motions of the forearms, with little wrist or finger movement. Now, this design has great ergonomic advantages, but it also has one drawback: You’ll need a sturdy desk. Mine, which is somewhat less than rock-solid, feels like it might fall apart during a run of enthusiastic orbiTouch-ing. The desk-rocking effect is largely dependent on the resistance level of the dome movement. There are two levels of tension available, 4N and 8N. Don’t ask me exactly what those numbers signify because I have no idea, but 4 means lower resistance and 8 means higher. Why would you want higher resistance? According to Dr. Peter McAlindon, the inventor of the orbiTouch, higher resistance makes it easier for beginners – or those with severely limited dexterity – to hit the correct quadrant when sliding the orbs. Even on the 8N model I received, it’s quite easy to accidentally activate Blue instead of Orange, or Yellow instead of Green. Unfortunately, the current orbiTouch has its spring tension set at the factory, so you have to order a different one depending on the resistance level you want. According to Dr. McAlindon, a model is under testing which will allow the user to adjust the required force on the slider springs, so action can be lightened as skill increases. I think this will be a big improvement. Obviously, the orbiTouch is designed for usability, not speed. 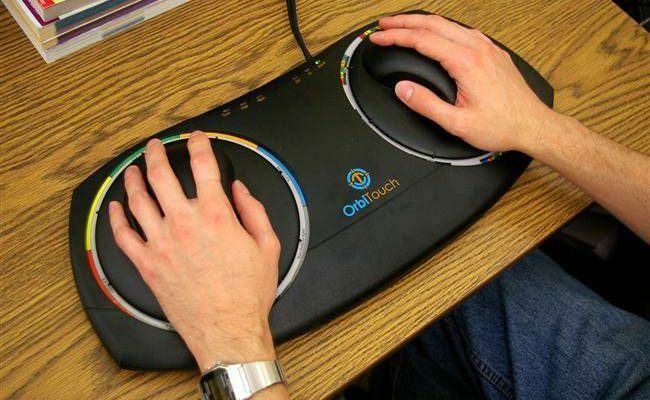 Dr. McAlindon says that the theoretical WPM limit for typing on an orbiTouch is somewhere in the mid 30’s. This may sound low when compared to the 60’s or 70’s most people can hit with a standard board, but it’s pretty high indeed when you compare it to the speed limit faced by certain disabled people, which is often 0 WPM. While I found the orbiTouch very easy to use, I didn’t persist with it long enough to achieve any measurable speed. Another reviewer, more patient than I, reported reaching 15 words per minute in about 6 hours. Blue Orb itself mentions 40 hours as a typical time to achieve proficiency on the device. Blue Orb has a strong focus on helping to improve the lives of those with disabilities. People with cerebral palsy, for instance, usually possess ordinary or even above-average intelligence, but have difficulty communicating because of their handicap. They have trouble not only talking and writing, but also using that basic accessory of the information age, the computer keyboard. By removing this frustrating obstacle, the orbiTouch allows people with various debilitating conditions to communicate effectively, and even to have gainful employment which would otherwise be beyond their reach. I was particularly glad to hear that orbiTouch units are getting into the hands of disabled American veterans. There is no other two-handed input device I can think of that would allow someone to type and mouse using a prosthetic arm or hand, and there are surely many veterans doing just that thanks to Blue Orb. 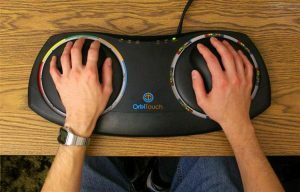 If you are just starting to experience a little discomfort while typing, the orbiTouch is probably not the device for you, as it costs $400 and will likely cut your productivity in half. 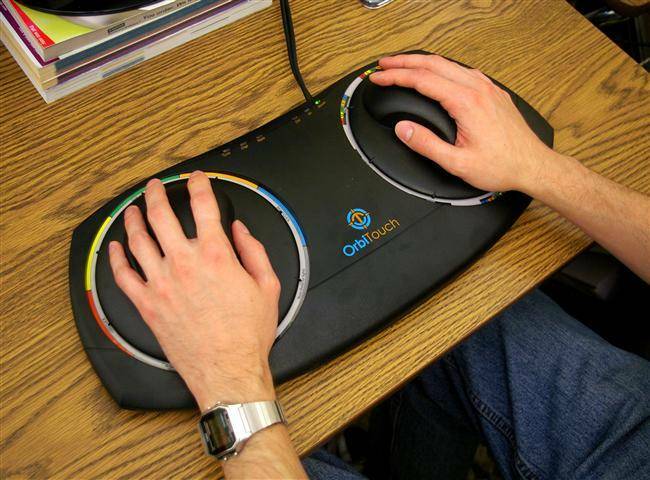 If, on the other hand, you are severely disabled and desperate for a way to use your computer, the orbiTouch may be the only answer. In many cases, that weird-looking device with two plastic domes can make all the difference in the world.